A new game release and two game updates in one week? Is Hirez plotting to take me down? You won’t see Hand of the Gods here though, I’m afraid. My review of that is coming though, fear not. But OB66 was both announced and released this week, coming with it Paladins: Battlegrounds’ alpha test. I’d just like to point out guys that I was right. Look back to last week, called it! Next week will also bring Smite’s 5.3 and the highly-anticipated, highly-whined-about Achilles, the Hero of Troy! Reading SMITE’s Twitch chat is a really upsetting thing to have to do, and I did it. I can’t imagine anyone doing so willingly. That was a lot, and I mean a lot of whinging. I won’t break down all of the patch notes here, because Paladins had like 75 changes to characters, and I’d like to actually do something else this morning. I’ll try and cover as many important things as I can! 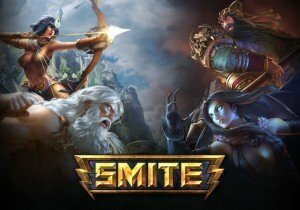 5.3’s a pretty big patch for SMITE! A lot larger than I gave it credit for, as I was watching the patch notes. But I did had to step away to get something to eat halfway through, so perhaps that’s why it seemed so much shorter to me. Achilles is coming, but I’m not talking about him here. My review of him is on the way, so don’t worry. I will say though that his kit looks like a hoot and visually, they got him spot on for a pretty-boy, arrogant badass who came right off the cover of a Romance Novel. There’s a lot of fears that he’s going to be OP, but I haven’t bought into that yet. Let me play him first, before I say one way or another, yeah? A lot of items were adjusted, quite a few gods have been tuned, including gods that people were complaining about! Is it enough? Will the kvetching stop? Come on, this is an online game, don’t count on it! But it’s definitely a step in the right direction, and as predicted, this was a patch where a lot of stuff got adjusted, arguably for the better. Some of the changes were honestly kind of strange even if they make a little sense (Lookin’ at you, Cerberus). Lifesteal and Crit items changed a bit, blessings were adjusted! The bug fixes were small, but they definitely matter. Now Summoners in Da Ji’s adventure won’t spawn out of reach (which happened a bunch to us), The Morrigan’s icon won’t be revealed on the minimap while stealthed, Ah Muzen Cab’s Passive is no longer classified as a Pet Ability and an issue with Discordia’s Passive Ability Buff FX, where it could become invisible. The full patch notes can be found here if players are interested. There are a few other minor quality of life changes, such as the DJ Skins so now they all move with their VXG’s active, which is honestly the best change of this whole patch and that is the hill I’ll die on. Ranked Draft Time was also changed (Conquest/Joust) to have less Planning Time (30s down to 15) and reduced Banked Time (60s down to 40). I’d be upset about this if I weren’t so tired of people holding it hostage and wasting it. Now there will be less time for them to waste, but it’s kind of a double-edged sword. People will no doubt still waste it. . . And I guess Console players now have something to be happy about: They have access to all VGS commands! Shoutout to ClumzyD for winking and pressing a button to fix it. For non-Conquest modes, Attacker/Defender/Specialist’s blessings have come back, which is wonderful! The jungle blessing made zero sense in Arena since there were a whopping six jungle camps on the whole map, no exp camps none of that stuff. It just didn’t work. So having access to those again is really kind of nice. Speaking of blessings, let’s skip ahead briefly. Warrior’s Blessing is being adjusted to have less of a sudden spike in power while also giving it more bonus protections when evolved. Killing a god now only gives 3 stacks instead of 5, and it gained 5 more protections, going from 10 to 15. As someone who has been branching into the Solo Lane, failing and dying once can mean you are very behind out of nowhere. Hunter’s Blessing also saw some adjustments. It’s been changed quite a lot, so I’ll give you the Patch Notes recap: “This fixes a few issues where this item interacted with various abilities and systems in the game. This item now better interacts with hit chain progression, abilities that scale with Basic Attack damage, and a few edge case scenarios. In some case, this is a buff for characters (anyone with a slower hit chain) and in others, this is a nerf for characters (The Morrigan’s Passive).” Before we get into more item/god changes, let’s get a list of new skins! Kage Ratatoskr (Exclusive, Adventure): The shadow-form of Anime Ratatoskr! This is arguably the coolest version, in my opinion. I stand by it. Found in the boxes. Abyssal Warrior Wukong (Exclusive): Great, now more people are going to be playing Wukong because he has a sick Abyssal skin. It’s not as great as Ares, but that’s no shock. Countess Chang’e (Exclusive): Is it a rule that Nu Wa and Chang’e get skins at the same time? This evil, Vampiric Chang’e is still gorgeous. Nu Wa wins this patch though. Pot o’ Gold Fafnir (Exclusive): Honestly, I thought we’d see this last year sometime. I LOVE the Dragon’s look/animation, and it’s not a big shock in the least. Look for me and Trunath to team up with the Loki skin. Playful Bunny Nu Wa (Exclusive): It’s Bulma from Dragon Ball! Except she has Peeps. Peeps are garbage-tier sugary treats. But every single bit of this skin is amazing, and now I want to play Nu Wa. Damnit. Puff the Greedy Dragon, lives on a mountain of gold...! Not as catchy, sadly. So, item changes! Some of these are huge, some are minor. Soul Gem‘s Passive got the Hunter’s Blessing treatment, reworking how it interacts with god abilities to make it more consistent: “On successful hit of an Ability, you gain 1 stack. At 4 Stacks your next Ability that damages an enemy God will deal bonus damage equal to 40% of your Magical power, and will heal yourself and allies within 20 units for 40% of your Magical Power and will consume the 4 stacks.” Typhon’s Fang needs to go to Hades where it belongs. Oh come on, that was funny. It lost 10% Magical Lifesteal (15% down to 10%), and the Passive Healing bonus from lifesteal also got nerfed (50% down to 40%). To be frank, I think next patch this will take another nerf. I’m not entirely sure this is enough, but we’ll just have to see. If I can get a chance to use it on PTS (if it will ever load for me …) I’ll give it a whirl. One of the things Ajax is definitely looking to move away from is an item that is a must-buy on a type of god. With that in mind, Warlock’s Staff also saw a bit of a nerf, as it was the clear, dominant choice for all mages more or less. It saw a Power decrease (75 to 65) and a Power per stack nerf (.6 down to .5). It now provides 115 Magical Power when fully evolved, down to 135. It’s not that big of a deal. Mages have to acknowledge when some of their tools are ridiculous (but I don’t imagine they will). One last Mage change, in Book of the Dead. It saw a flat decrease in the mana used to form a shield on the mages. It’s very powerful as a survival tool for mages, but it’s a bit too much. It saw a decrease in the Mana to use its shield, 25% down to 15%. It is still useful, and still powerful, just not an end-all, be-all solution. Much like last time, where people cried for Deathbringer, it’s time to cry for Malice. It’s been adjusted and changed a bit this week, losing some Physical Power (50 down to 40), gaining more Critical Strike Chance (20 to 25%), and received a new Passive: “Every Critical Strike against an enemy God gives one stack. At 3 stacks, your next ability that damages an enemy God will consume the stacks and deal bonus damage over time to the first God hit for 120% of your physical power. Damage is dealt in 3 ticks over 2s.” Malice is now focused more on ability damage characters who also want a little Crit in their lives. I think this one’s ultimately going to be a really good one for particular Hunters and Warriors who want to do flashy things, while not sacrificing too much Physical Power to do so. Rage however, took more adjustments. The cost went up (2400 up to 2500), lost Physical Power (30 down to 20), and the increased Critical Strike Chance went up (1% to 2%). It now provides 40% Critical Strike chance in total when fully evolved (up from 35%). Rage is an amazing item, but it’s probably the most potent Critical Strike item in the game right now. It did need the cost increase I think, as such a powerful item. So a couple of fun god mentions this week. Definitely not covering all of them, just the ones I find most fascinating. I’m gonna start with Cerberus, who really hasn’t been performing all that well that I’ve seen. He hasn’t been making an impact in matches unless there’s a serious amount of setup for it. To that end, Ghastly Breath is increasing its damage per tick (15/25/35/45/55 to 20/30/40/50/60), Soul Expulsion is getting a range increase (Thank. God. 40 to 50 units), and Stygian Torment is seeing several changes. The post-fire went down from 1.4 to 0.1, and now Cerberus is crippled for 1.2 seconds after using it. He is also knock-back/knock-up immune for that time. The ability now also Auto-Activates all three heads. The cripple is a weird choice, but it’s probably to balance out that his ultimate now pops immediately. That wait timer was insane, and let people get out of it much easier than say, Ares’ grab ultimate. I’m so happy to see these Cerberus buffs. Ullr got nerfed, too! Despite Ullr being insanely powerful and banned in virtually every match, his numbers didn’t show a “must nerf” situation. He’s a hard god to balance when compared to a high skill level and a more general sense. Bladed Arrow saw a 10% reduction in its Power Scaling, and Hail of Arrows saw a decreased Physical Power Scaling (120% to 110%). This ought to slow down some of his insane, ridiculous burst. He’ll probably still get banned as a problematic god. But speaking of those. . .
Peeps are vile. Nu Wa is not. Nu Wa is love, Nu Wa is life. Serqet also saw a nerf! She’s another must-ban-or-get-yelled-at god in Ranked Conquest right now. It’s not a giant nerf, but the power of her Deathbane ability is without question. The cooldown went up (10s to 13s) and the saw a reduction in Physical Protection Reduction (15% down to 10%). Freya is in that same camp, where she’s far too strong for her own good and has become a must-pick-or-ban. Well, she’s been like that for a while. Her Brisingamen’s Blessing was toned down a lot, changing the Magical Lifesteal from 15% down to 5% + .5% per level (ending at 15%). This means she won’t start absolutely obliterating people, but she’s still going to be a late-game survivor. This just tones down her ludicrous power in the early game, letting people actually bully her around a bit. Irradiate lost both damage (40/55/70/85/100 to 35/50/65/80/95) and Magical Power Scaling (25% to 20% per shot). She needed it, and if you think otherwise, you’re a liar, or a Freya main. But there were some buffs this patch. Arachne’s Web saw a Cooldown reduction (18s down to 16s), along with 3 webs, up from 2. This will make her a bit more viable in the main game modes, and make her even more terrifying in the Smite Adventure. Khepri got a buff, too! A lot of guardians are about to be adjusted, according to patch notes, which I won’t lie, fills me with trepidation. I hope that it sees Artio and Ymir see some nerfs (mostly in their damage output), along with Sylvanus’ ability to use Hunter Blessing and stomp out lanes with incredible power. Khepri’s Abduct loses cooldown time by one second (down to 14), and Solar Flare dropped two seconds (18s down to 16s). These might not seem like much, but it will definitely help Khepri feel like he matters, in a world where he’s seldom picked. His cooldowns were just insane for no real reason if you ask me. He’s a low performer and seldom picked, making it seem worse. Scylla is another god who suffered from the Rod removal, and more with the new itemization. Quick Learner now has an increase in Power per stack (20 up to 25), Sic ’em! sees an increase in Magical Power Scaling from 75% up to 80%. It’s not going to make her a bannable god, but should offset the incredibly weak late game she has, and make her the burst mage she was meant to be in the late game. Oh my lord. The patchnotes for Paladins OB66 are so dense. If I were to go over all of it, this piece would go from 2095 words (at present count) to like 3300. And I have other stuff to do today! I will leave a link below for all of the numbers and important bits for Paladins because there are some pretty major changes to champions and just in general. Paladins’ client, for example, will automatically launch in 64bit if it detects your PC is capable. And sorry for 32bit computers, Paladins: Battlegrounds is only in the 64bit client. It’s a mode that likely requires a lot of processing power and graphical intensity, especially for Paladins, so it’s important that you have the 64bit client. ‘High’ graphics are the minimum setting allowed for the 64bit client also. Some people are crying about Siege requiring level 15 though. It’s the primary competitive mode for Paladins, so they’ve increased the level of this queue. The main complaint seemed to be “Great, now those low-level newbies will be against people with all level 10 cards in unbound modes! UNFAIR. UUUUNFAAAAAAAIIIIIIIIIRRRRR!!!!! !” Ahem. Matchmaking does exist. I have a feeling that level 5 accounts probably won’t be against level 100 accounts. Not unless they’re partied with high-level people. So, have some faith, yeah? And having powerful cards doesn’t make you good at the game. I promise. So. Many. Bug Fixes. Goodness. There’s something like 70 bug fixes, so please, go read them. There were quite a lot of Champion changes as well. A fine example is Grohk. He was incredibly powerful, high damage output, as well as survivability. He has the highest win rate of any Support, but also one of the highest win rates across all champions, at all skill levels and in all queues. As a result, he lost some Health (2500 down to 2400), Healing Totem saw some reduced Health (1500 down to 1000), Totemic Ward has a decreased healing buff to totem by 10%, and Wraith’s internal cooldown up by 15s. He’s still useful and strong, but now he’s not an unstoppable machine. I doubt he’ll fall off too bad. I do not understand why they changed Willo‘s voice though. The idea was that she was annoying. People hate how strong she felt in some matchups, more than her voice. Now that it’s being changed, people are complaining about that, when people whined about her voice in the first place. Just can’t please people, I guess. So definitely go read those patch notes and see how your favorite champs have changed. I didn’t see anything that I really hated one way or another. Cassie and Kinessa saw a lot of adjustments. But I do want to talk briefly about Paladins Battlegrounds. It’s changed a lot since I last played it, and definitely for the better! The Legendary Items that were in the Pre-Alpha at HRX were nuts, and getting them meant easy victory, or so it seemed. Now those Golden Chests drop Legendary Cards, which you certainly need. This is an unbound mode, so the Card Shrines drop cards for your character’s abilities. I am not 100% sure if it is based on your actual card, because I’ve seen Level 13 Power cards for some things. So I can’t tell if that’s a general power level or the card’s level. It’s something to investigate, for sure. But now you have Chests (Standard In-game items. Green/Blue/Purple to correspond with the power level of the item), Card Shrines (cards for your champ), and the rare, powerful Gold Chests (Legendary Cards). The regular chests stop being useful when someone on your squad gets them, but everyone can activate the card shrine. They show up on the map (regular chests don’t), as do golden chests. But you can queue as a Solo (every man for themselves), Duo, and Quad. As a note, even if you queue as Quad, you can have 2 or 3 people in the party. It just means your total team will be four people. When you’re gunned down, you turn into a chicken and can be revived up to three times. Paladins: Battlegrounds is here! GET HYPED. But if they’re killed in chicken form, that’s it, game over. The map is huge, and you can pick from 8 random champs (two per role). You might not see someone you’re good with, and that’s fine. This is not a mode where I say “play meta!! !” because there is no real meta! I’ve seen 4-Viktor squads, 4-Jenos squads, all kinds of weird stuff. Play what’s fun, that’s what it’s here for. Will there be a “Ranked” Battlegrounds? I can see it happening. It’d be a fun side-tournament at HRX to watch pros/would-be pros getting down to shenanigans. There are also VIP rewards for a high rating, so that leads me to think there would be a ranked future for Battlegrounds. That hasn’t been decided on when those ratings will be rewarded, but you can see it in-game. It’s an incredibly fun mode, with a lot of tactics and ways to approach it, which you can stay tuned for because we’ve got some plans cooking!